Want to buy 10 properties in 10 years, and still have money in your pocket? It’s possible. Property Rich will show you how. Authors Melissa Opie and Stephen Zamykal guide you on your investment journey by combining a revolutionary approach to loan structuring that the bank won’t tell you about – the Kitty Loan System – with expert advice on property investing. Be financially free through smart property investing. Melissa Opie runds an award-winning buyer’s advocacy, vendor’s advocacy and property management business, Keyhole Property Investments (KPI™). Melissa owns multiple investment properties and has bought hundreds more in her role as a buyer’s advocate. Stephen Zamykal is the director of four award-winning Mortgage Choice franchises. Using his unique strategy, and by ensuring the right ownership structures are in place, Stephen has purchased multiple investment properties in a sort space of time and enabled clients to do the same. Melissa and Stephen host regular property investment seminars. 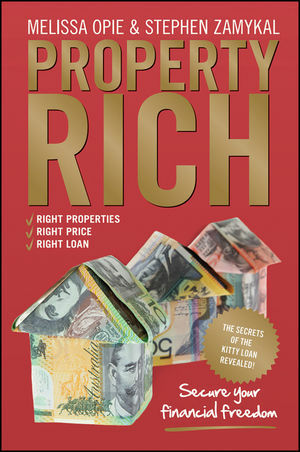 Find out more at www.propertyrich.com.au. Part I: Getting the lifestyle you deserve. 1 Beginning with the end in mind. 2 Understanding why property is a good investment. Part II: Getting the bank to pay for your investment. 4 Understanding the kitty loan system. 5 Step 1 of the kitty loan system. 6 Step 2 of the kitty loan system. 7 Step 3 of the kitty loan system and understanding the banks. Part III: Finding and buying the right property. 8 Narrowing your property search. 9 Assessing a property's potential. 11 Treating your property investing as a business. 12 Managing your rental property. 13 Building and maintaining your investment portfolio. Appendix A: Resources for landlords.